So you're heading to South Korea. Awesome! 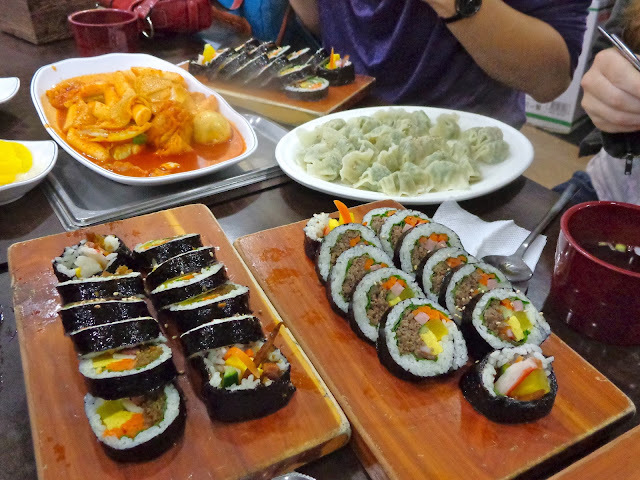 Whether it's for a short trip, extended travels or perhaps to teach English, you definitely don't want to miss the rich world of Korean food. As delicious as all of it is, I totally understand that some of the food can be intimidating or difficult to explore if it's your very first time in Korea—especially with the language barrier. Here's the menu from a restaurant in the small town where I lived. Yup, it's that yellow sign on the wall, that's the menu. So I know why it could be tempting to opt for a touristy restaurant with a nice laminated menu in English and Korean (if that's even an option!). Because the food on that yellow menu? It's incredibly delicious, cheap, and as authentic as it gets. 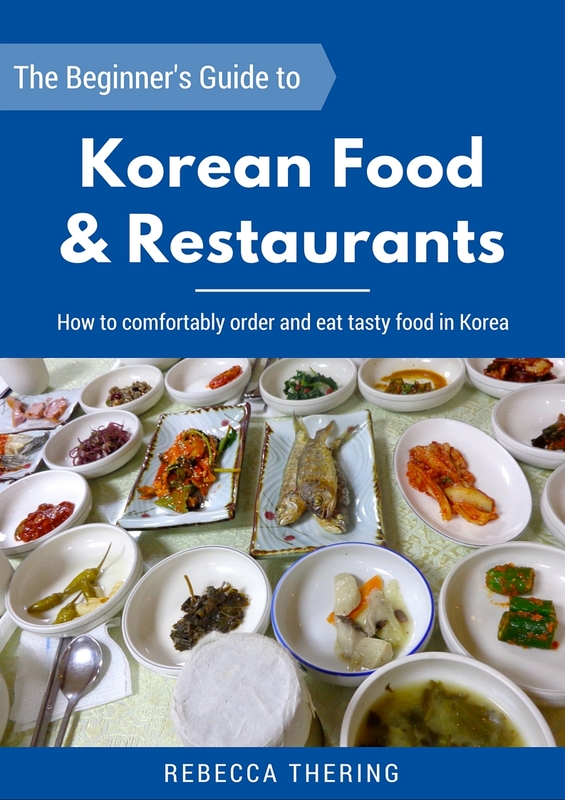 So that's why I've put together a guide to Korean food and restaurants, filled with all of the knowledge I wish I had known when I moved to Korea in the fall of 2013. Why are there plastic "slippers" in some bathrooms and what should you do with them? What are those weird restaurants with the thick metal tubes coming down over each table? What's the most respectful way to pay? 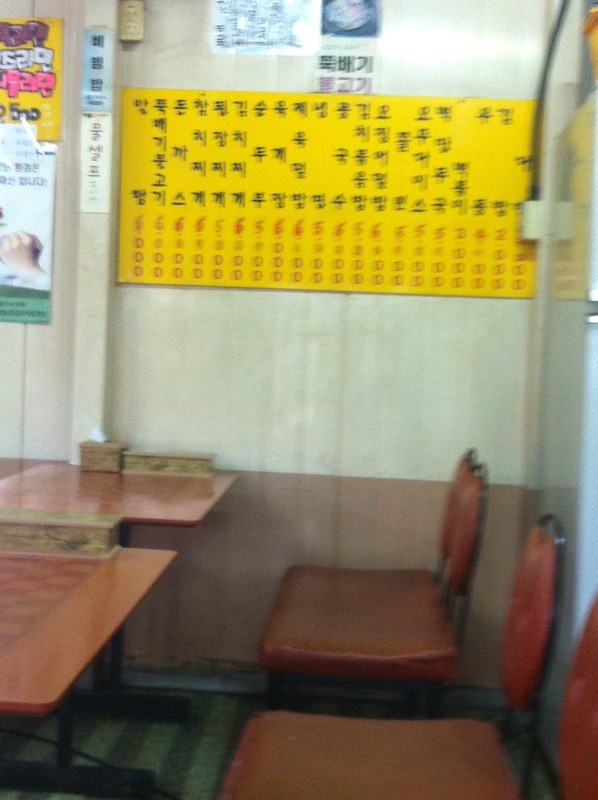 How the heck am I supposed to know what/how to order when the only menu is a sign on the wall written in Korean? ... and much more. In fact, let's take a closer look at everything I cover in this 46-page guide. Contents of "The Beginner's Guide to Korean Food and Restaurants"
My motivations for making this guide, and how I hope it'll make you feel comfortable and confident to walk into any of these types of restaurants and enjoy a memorable meal. Here you'll get familiar with common tasty street foods through pictures and descriptions. These eats are sure to keep your tummy and wallet happy. This chapter contains everything you need to know to navigate Korean restaurants—from where to find the chopsticks and spoons to what you should expect in the bathrooms. 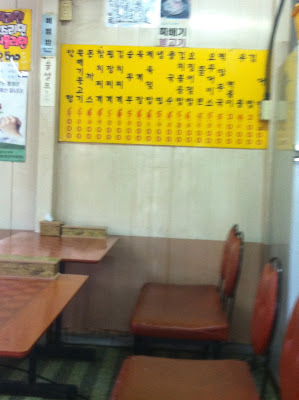 Organized by type, here are over 40 dishes and beverages you might see on a Korean menu. A type of restaurant you'll definitely want to visit, we'll look at 10 types of foods which are commonly served here—plus what their variations can look like. Korean barbecue is a must-do! This chapter takes you through the whole experience—from how to order the meat to what you're supposed to do with the basket of lettuce on the table. A brief overview of a few common chains in Korea—in case there's ever a day where you want to grab a really quick bite (or if you're curious what fast food tastes like in The Land of the Morning Calm). A selection of handy apps, blogs, and sites that will help you have an even easier time digging into Korean cuisine. If you'd like to enjoy amazing and authentic food while you're in South Korea, this e-guide will prove to be a valuable resource.